Book today and pay 50% deposit for your ferry crossing with the balance not due until 45 days before you sail. For a short time only you can book your ferry crossing with just a £10 deposit and the rest payable 30 days before departure. Where do I use my DFDS Seaways voucher code? Copy the DFDS Seaways offer code from NetVoucherCodes and click through to the website. Search for a crossing by using the booking form on the homepage. Select your outward route and return route, departure & return dates, number of passengers and choose a vehicle type. At the bottom of the form, enter your DFDS code into the box and click ‘Book now’. Next, choose from the available tickets. Add any extras such as insurance and breakfast. Register passenger details and continue by creating a password. Your discount will be applied automatically, select the crossings you would like & continue with booking. "For cheaper ferry tickets avoid peak times such as during school holidays if you can. Generally, the lowest fares are available when you book in advance so it generally pays to plan your trip in advance." DFDS Seaways offer ferries that sail to France, Holland, and Denmark and ensure to carry you, your family and even your car across in comfort. DFDS provide a variety of travel options from multiple locations around Europe as well as long stay mini cruises. Onboard each ship you’ll find a variety of amenities like bars, restaurants, shops, cafes, children’s play areas, entertainment options and more to help you enjoy your time at sea, and there’s always the bracing ocean breeze above decks if you feel like a little open air. Departing from a port in Newcastle, DFDS Seaways’ popular mini cruises and short breaks are perfect for families, couples, or groups of friends. Mini cruises offer a combination of both a city break and a relaxing time onboard, they’re incredible value for money and a more enjoyable way of travelling (unless you’re sea sick of course.) All mini cruises also include coach transfers from your port to your destination so there’s no need to arrange alternative transport for when you arrive. One of the most popular mini cruises available at DFDS Seaways is the Amsterdam mini cruise. With this great getaway, you’re able to spend 2 nights onboard one of the most modern cruise ferries, enjoying excellent facilities and amenities onboard. If you’re after something different there’s a range of special themed mini cruises which vary each season including Keukenhof Gardens, Halloween and Amsterdam Zoo. With plenty of canals and streets surrounded by water Amsterdam is the perfect city to explore using a relaxing cruise. Not only can you admire this wonderful Dutch City by boat you also have five hours to run around Amsterdam catching glimpses of beautiful scenery and a truly unique culture. DFDS Seaways offer multiple ferries and sailings to and from Dover including Dover to Dunkirk and Dover to Calais. Crossings from Dover to Dunkirk are quick, convenient and great value too. Lasting just 2 hours, they’re the perfect way to begin your European holiday and cross the Channel in your vehicle, with easy access from the departure port to destinations in France, Belgium, Germany, and Holland. The route from Dover to Calais is also extremely quick, convenient and hassle-free, making this another ideal way to begin a trip to multiple locations and cities around Europe. Travel by car, caravan, motorhome or motorcycle and enjoy the convenience of going on holiday with your own vehicle. What’s more, thanks to the addition of 2 new ships on this route, DFDS Seaways now operate up to 30 daily sailings, making it easier than ever before to hop across the Channel to another country. Set sail to France with the World’s Leading Ferry Operator, DFDS Seaways and cut the cost of our trip. Not only do DFDS Seaways offer mini cruises to Amsterdam they also offer a range of ferries, making it easy for you to access the Dutch Capital at your own pace and leisure. Why take a boring flight across to this glorious, culture-rich city when you can experience an enjoyable journey across the beautiful water with plenty to do on board and gorgeous surroundings to admire on deck. As the capital, Amsterdam is naturally Holland’s centre of culture, the city is also home to the highest museum density of any city in the world! There are plenty of places to visit, including the Rijksmuseum, the Van Gogh museum and the Anne Frank House, all of which give you a different outlook on what was once one of the most powerful cities in the world. Amsterdam is also well known for its nightlife, with an excellent selection of bars, restaurants and more for you to discover. Do you accept foot passengers? Foot passengers are accepted on the Newcastle-Amsterdam, Newhaven-Dieppe, Copenhagen-Oslo and Baltic Sea routes. Yes. DFDS accept pets onboard their ships. Unfortunately DFDS does not provide cots on long sea routes, however, bed rails can be requested from the Guest Services Centre onboard the vessel. Can I travel with horses? If you intend on travelling with horses you must not book a passenger fare. Instead, you must make your booking via the freight department which can be found here. 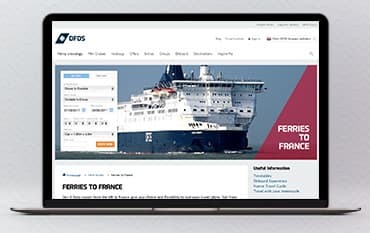 DFDS is an international shipping company specialising in overnight passenger crossings and ferries. Sail comfortably to your destination aboard a DFDS Seaways ferry, and let your journey be an enjoyable part of your holiday rather than a plain necessity. Not only do DFDS offer an international level of quality service but also stylish surroundings and a welcoming atmosphere that makes every journey comfortable and relaxing. With one of our DFDS voucher codes, you can enjoy big savings across their range of travel options. We are constantly on the hunt for Voucher Codes for DFDS Seaways to help you with your money saving. Our experts check dozens of sites for secret codes including NHS discounts, student sites & social media channels saving you time & money!